Lovely set of doll furniture made of wood. Would fit a doll the size of Barbie. Consists of a complete bed, an armoire and a chest/nite stand. 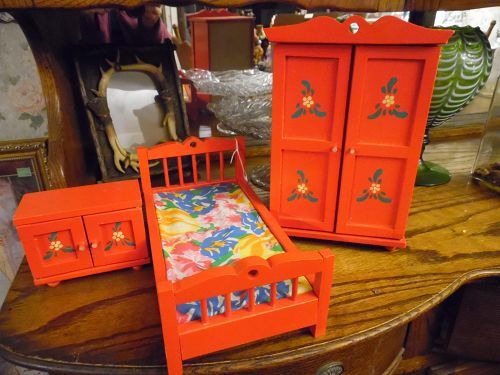 Bright cheery red with folk art floral embellishments.Fabric bed covering. Looks to have never been played with and is in pristine condition. Sold as a set. Inside measurement of bed has a 9 5/8 length for your doll. Armoire is 10 1/2" tall. Doors open and close.